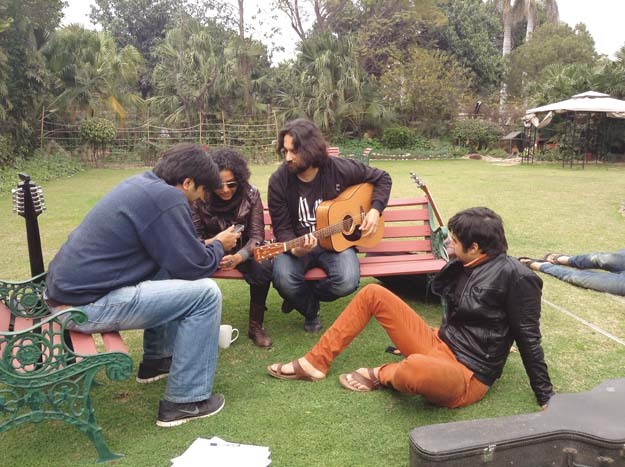 LAHORE: Rock band Noori may have declared Begum Gul Bakaoli Sarfarosh as their final release but it seems the duo of Ali Hamza and Ali Noor believes in the notion that promises really are meant to be broken. Their fans would certainly not complain hearing that the band is set to release a single that will see them collaborate with Indian folktronica duo, Hari and Sukhmani. Noor’s wife and veritable right hand, Mandana Zaidi, concurred. “Sukhmani’s voice added a great flavour because I’ve never heard a woman’s voice in a Noori song before,” she said. Zaidi said the entire process was carried out without the support of anyone. “It was just an effort from the artists involved,” she said. Noori is a group that itself believes in the DIY philosophy; they released an album at a time when the music industry is probably at its weakest. When they first met vocalist Sukhmani Malik and producer-vocalist Hari Singh in Dallas, US, they immediately struck a chord. “We heard their music and decided to fly to India. Once we were there, we agreed to work on a song. The song was sent back and forth and eventually they came to Pakistan for five days to shoot the video,” Zaidi added. Separately, Noori will be flying to India for the Nations for Peace concert that will also be held on March 11. Nations for Peace will feature musicians from Bangladesh, Bhutan, Nepal, Sri Lanka, India and Pakistan come together. Yaarian will be officially released during the show. After this, a tour of different cities in Pakistan is also on the cards for the Lahore-based band. Interestingly, this is not the first time Noori is working with an international act. In 2004, they collaborated with Indian musician, Anaida, for a single but the song never saw the light of the day. The band that has joined hands with various artists on Coke Studio in the past, feels as long as original music is being made, all is well. “People should explore their creativity and make songs about issues that something to them,” mentioned Noor. Malik and Singh have been globetrotting since 2009 and collaborating with artists all over the world. Known for fusing Punjabi folk music with electronica, they a very contemporary take on traditional music. “The band’s motto is to leave behind cultural, religious, and racial divides to transform the community and the individual through happy soulful music,” reads their website. Published in The Express Tribune, March 8th, 2016. This second album by noori was a follow up on where Suno Ke Main Hun Jawan left off. It talks about what happens when the ever so energetic and hopeful youth grows up and faces the realities of the world. The discontentment and suffering which arises in this growing up, creates an indifferent and self-centered individual, who finds escape routes in things like drugs and other short-lived pleasures. Peeli Patti Aur Raja Jani Ki Gol Dunya is a call against such indifference. It depicts reality as it exists in our society today, and begs for a reconsideration of the direction people are carving out for themselves in these times of turmoil. Musically, the album brought out a darker and maturer side of the band – something they carried well with their new, don’t-give-a-damn image of long hair and beards. Apart from popularity, it brought a newfound respect for the band – not just as musicians but as individuals who cared for society and genuinely wanted to make a difference. ‘One day you wake up and realize that life is no longer the same! You look into the mirror and it takes you a while to recognize yourself. You walk out into the world and you’re overwhelmed by its commotion. You run around all day, with no peace of mind. Sometimes you’re not even sure what you’re running after. And when you are, you don’t think twice; you avoid reconsidering! You tell yourself, “I don’t have a choice… I have to survive!” You console yourself by thinking that you’re better off than all those who have absolutely nothing to hold on to, yet you are never satisfied! You know it’s a vicious cycle, yet you prefer the groove! Convenience is the order of the day! Such is what we have inherited from our past, and we continue to preserve this legacy, calling it the innate animal-instinct! The beauty of nature, however, lies in its inherent ability to discern the disorder that grows within and then to fight back to re-order – and so we have witnessed in history, the rise and fall of so many great nations and civilizations. We have seen how nature has taken us back to the most primitive levels of existence whenever we have tried to defy it consistently. The only question which matters is that how long will nature allow this defiance to last? Today we see our people in a state of self-denial. We are victims of a very myopic view of life, where the center of attention is only our own self, and a future that does not go, at best, beyond the scope and span of our own lifetime. We seek short-lived pleasures while we turn our faces away from the unpleasantness and sickness that surrounds us. We love ourselves and ourselves alone, yet we are oblivious of the harm we are causing to our mind and body. We live for the moment, as we fear our mortality; but we kill ourselves every single day! Peeli Patti aur Raja Jani ki Gol Dunya is the story of our society in this very context. It questions the very premise on which human beings are functioning in this day and age. It pinpoints at how we have been nurturing an indifferent stance towards life, and how, in doing so, we have harmed not only our external environment, but also our inner selves. It reflects on the growing frustration around us and sheds light on our discontentment with life in general. It urges for a collective introspection. It searches for a hope that one day we will rediscover ourselves. It begs our people to act before it’s too late; before nature decides to take its toll on us. Because then, we will have no choice! noori’s debut album created whirlwinds across the Urdu speaking community all over the world! A first of its kind, it introduced the genre of pop-rock music to the Pakistani mainstream. In addition the album was also a departure from the beaten track of chummy love songs and focused instead on inspiring the youth of Pakistan to take up the responsibility of doing something worthwhile for themselves and others. Suno Ke Mein Hun Jawan is an album dedicated to the youth of Pakistan. The music of the album is energetic and aims at attracting the vigor and vitality that drives the hearts and minds of these young people.The objective of this album is to urge the youth of this country to pursue their lives and their dreams with passion. The lyrical content of the album also revolves around this very theme of following one’s heart and mind with complete faith in one’s abilities and potential to pursue the greatest feats possible. The focus of attention is specifically directed towards the youth because it is at a young age that one comes to terms with one’s independence and freedom; one’s mind tends to open up to new unexplored ideas, the discovery of which can turn into a pursuit of a lifetime. We have heard time and again the stories of the greatest thinkers and doers of all time; from scientists like Einstein and Darwin to philosophers and spiritual guides like Buddha and even musicians like Amadeus, who set out in the pursuit of their dreams at a very young age, the time when they had the ambition and enthusiasm to give themselves the initiative to realize their dreams. One may contend that greatness is achieved, if achieved, after an entire lifetime, or sometimes even after that, and that with time one starts coming across the complexities and hardships that life has in store. Hence, it is a good idea to enjoy one’s youth to its fullest as this time won’t ever return! We have no disagreement with this contention whatsoever. However, we strongly feel that our youth is a tilling ground for our future: when life starts getting complicated and creates obstacles for us. We have to accept responsibility of preparing ourselves for a happy and prosperous future where we can overcome these obstacles and solve complications without falling victim to them. Our youth provides us with the strength to channel our simple yet free and pure minds in the right direction; towards the pursuit of a future where we will look back and thank ourselves for making the decisions we made at the first turning point of our lives: Our Youth! The theme for Suno Ke Mein Hun Jawan is therefore the pursuit of our dreams with honesty, making the most of the fervor that nature has gifted us with at a very young age.